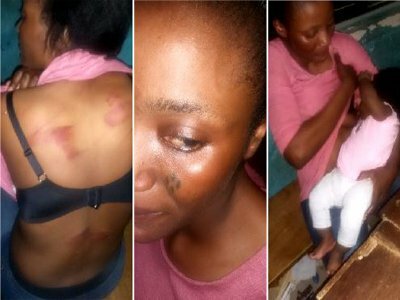 A Nursing mother Mrs. Toyin Adeyeye who was on way back home from the United States where she had gone to deliver her two months, old baby, Heritage, was assaulted and detained by some police officers alongside her younger brother, Adeniyi Dada, for refusing to give bribe to the Policemen at a checkpoint. It was also gathered that part from detaining the trio in the ugly incident that occurred in Ado Ekiti, the Ekiti State capital on Friday, the police also impounded the black Kia Picanto car with registration number LAGOS FKJ 221 EE with which they were coming from the market. When the Nation reporter visited the police station on Saturday morning on a fact-finding mission, the woman was seen breastfeeding her baby. “My wife and her brother were returning from the market at about 3.00 pm on Friday and on arrival at the checkpoint in front of the Pavilion very close to their station, they asked for all vehicle papers and driver’s licence which were produced and they are valid. After checking all the documents, the policemen were demanding for money to be given as ‘settlement’ which my wife and her brother refused. “My wife drew their attention to the baby that was crying in the car. Five of them were beating her at the point of arrest and on getting to the station, the beating continued. After thoroughly beating her, they obtained her statement around 10.00 pm. There are wounds on the back of my wife and face to show for it. It was also gathered that the state chapter of Federation of International Women Lawyers (FIDA), has launched an investigation into the matter as the state chairperson of the body, Mrs. Funke Anoma, visited the station in connection with the incident at about 12.30 pm. When contacted on phone, the state Commissioner of Police, Abdullahi Chafe, said the detainees slapped a policeman on duty and tore his uniform, adding that the matter was still under investigation.